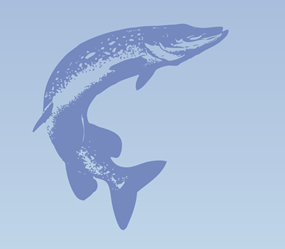 To establish riparian buffers and restore wetland areas along intermittent streams in the Suamico watershed in areas primarily used for agriculture but with high potential for providing northern pike (Esox lucius) spawning and rearing habitats. 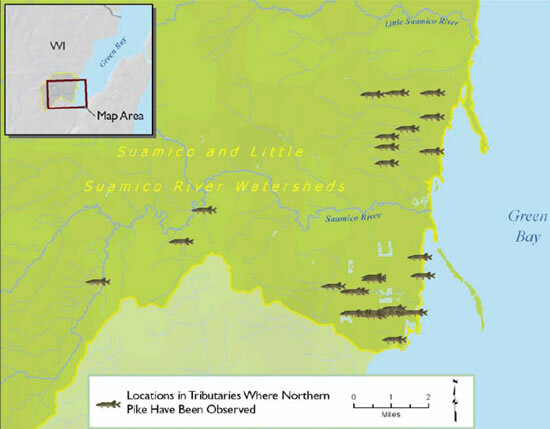 Wetland and spawning habitats in the Suamico and Little Suamico watersheds are degraded due to farming and development, leading to reduced hydrological functioning and degraded spawning habitat for top predator fish species such as northern pike. To restore ecological function and increase populations of northern pike and other spawning fish species, the project partners have and will continue to create vegetated buffers along roads and streams by working with willing private landowners. Similar restoration projects in the area, completed with other funding, have been very successful in supporting spawning pike populations. The buffers provide habitat for spawning fish, improve fish survival rates by moderating streamflow, and help reduce sediment and nutrient loads reaching the stream systems and Green Bay. Wisconsin Department of Natural Resources managers have assessed the available land near Suamico and identified target areas and optimum habitat improvement locations. Covenant language recorded with thedeed restrict development of the restored area and specifies a 15-year operation and maintenance agreement to maintain the riparian buffers. As part of this project, Brown County will monitor the restored areas for pike young for four seasons. This project will increase the spawning habitat for northern pike and improve the water quality and hydrologic functioning of wetlands, increasing plankton production and improving habitat for additional native plant and wildlife species. As production of northern pike and other native predator species increases, the ecosystem of Green Bay will re-balance. As of October 2010, 17 miles of stream corridor have been restored, together with 92 acres of wetlands/ spawning marshes, riparian buffers, and buffer plantings; a d d i t i o n a l buffer projects are planned. To date, NRDA settlement funds have accounted for restoration of 73.6 acres (80% of total), other funds account for restoration of 18.5 acres. 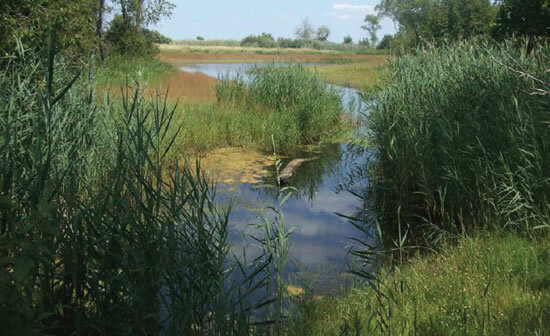 Restoration activities are currently ongoing and include wetland/marsh restoration and creation of buffer strips. The project received $622,000 in NRDA settlement funding and attracted additional matching funds and/or in-kind services for a total budget of $689,293. This project has successfully restored stream corridor, wetland, and riparian habitat. Restriction agreements made with willing landowners have allowed the creation of buffer strips that reduce sediment, nutrient, and pesticide loading into waterways. Similar restoration activities in the past have improved northern pike reproduction and water quality.